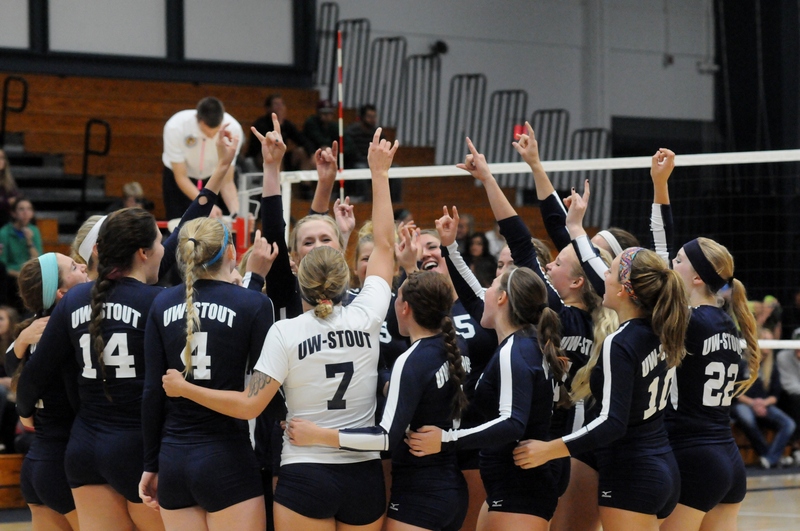 Before the volleyball season started, the consensus among WIAC coaches was that University of Wisconsin–Stout would finish in the middle of the pack in the final standings. In the pre-season rankings, Stout was selected to finish eighth in the conference. Coming off two straight 15-win seasons, the Blue Devils came into the year with every intention on remaining competitive in the WIAC. Despite the fact the team featured 10 new players and a new head coach Laura Evans, the Blue Devils were still confident they had a shot to do big things. “We are a close-knit team and we want to be the [best] in our conference,” said freshman hitter Ashley Pratt (Lakeville, Minn.). Molly Brion (Jr, Cameron, Wis.) believes the Blue Devils depth and commitment to working hard are the keys to the team’s success this season. The Blue Devils jumped out to a 5-0 start this year before hitting a bump in the road, dropping five of their next six matches. Sitting at 6-5, the Blue Devils went into the St. Catherine University Invitational on Sept. 19 and 20 determined and ready to play. By the end of the weekend, Stout’s season record had improved to 10-5. The winning streak came at the perfect time, with the conference portion of the Blue Devils schedule looming. “Our main goal as a team is to win the conference tournament,” said Morgan Denny (Sr, Luck, Wis.). In the WIAC opener, Stout hosted University of Wisconsin–Platteville and came away with a 3-1 victory. However, the second game of the conference season didn’t go quite so well. After winning two of the first three sets, the Blue Devils were unable to close out the match and the tenacious University of Wisconsin–River Falls squad won 21-19 in the fifth set. With the loss fresh in their minds, Stout headed to La Crosse, Wis. for the University of Wisconsin–La Crosse Invitational and a nonconference matchup against the No. 25 University of Wisconsin–Oshkosh. The Blue Devils came in and dominated in three straight sets, handing the Titans their second loss on the season. Later in the day, Stout kept the momentum going and defeated Luther College 3-1. With a 13-6 record a little over halfway through the season, Stout is primed for a strong run to finish out the year. Six of the Blue Devils’ remaining 11 games are conference match-ups and how they do in those games will determine whether or not they move on to the post-season. “Our team goal is to win conference and make it to the NCAA tournament,” Brion said. “We haven’t been to the NCAA tourney in quite a while now so that would be a huge accomplishment for our team. 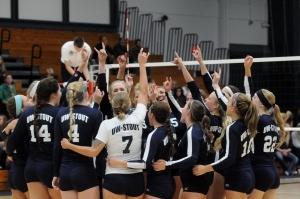 Check out our next issue to see how Stout does at home against the College of St. Scholastica Oct. 7 before going on the road for a pair of conference battles against University of Wisconsin–Whitewater and University of Wisconsin–Oshkosh on Oct. 10 and 11. The Blue Devils will also play Illinois Institute of Technology in Oshkosh, Wis. on Oct. 11 before returning home to take on University of Wisconsin–Superior on Wednesday, Oct. 15.